Coming back to the scene after taking a 2 months break from food blogging is not easy. You just find it that much harder to get the momentum going. One day I can be super gung-ho, going through sites and books on recipe ideas, but another day I just feel like chucking them all aside, refusing to take a second look at the number of "backlog" recipes I have on hand. It is not that I do not enjoy being in the kitchen, snapping pretty pictures of the end products and sharing them with everyone, but I just can't seem to find that motivation for the longest time. But hey, I am back! That's all that matters isn't it? During this short break, I actually spent more time catching up with friends, put in more hours in my teaching job and more important, I spent more time with myself. I want to believe that I am now stronger and I kind of appreciate life better, as what it is. As cache as it sounds, everything does happen for a reason right? Right. Back to food blogging. 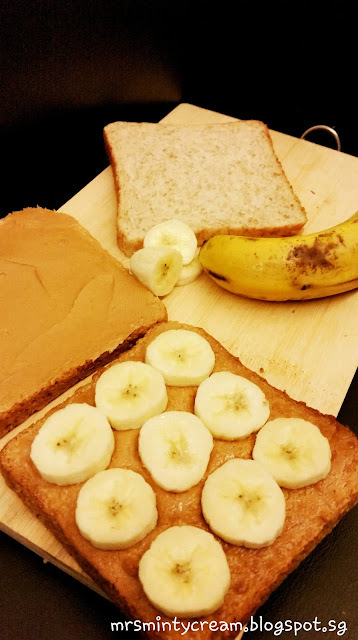 Although I have not been baking/ cooking much lately, one thing that I do engage in on a daily basis (or at least I try to make it 3-4 times a week) is Breakfast Preparation! I do up these breakfast boxes for my hubby so to make sure he has a decent breakfast and he gets all the energy he needs for his work. 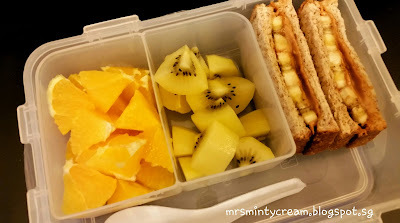 As such, I am constantly on the lookout for quick, fuss-free and yummy breakfast ideas. Be it a simple recipe for Tuna Melts (with a twist in adding cottage cheese and dill) or 20 ways to incorporate colours in your breakfast, count me in! And this week, I tried out the warm and sweet Toasted Peanut Butter & Banana sandwich. 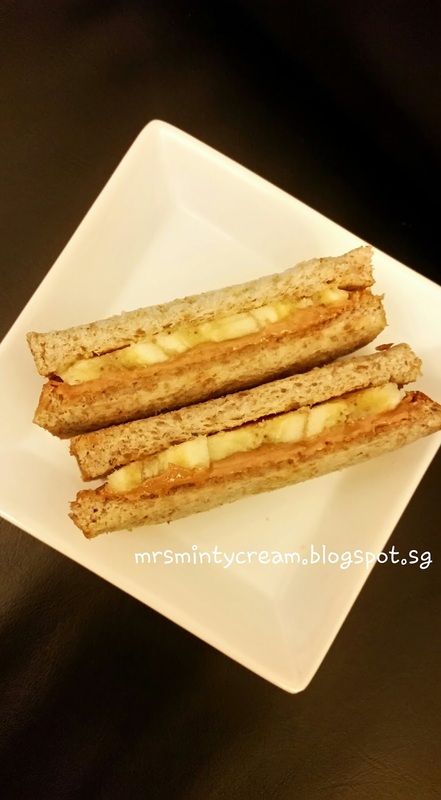 It is such a yummy alternative to its more popular counterpart, P&J sandwich. Make sure your bananas have really ripen before you do this okay. 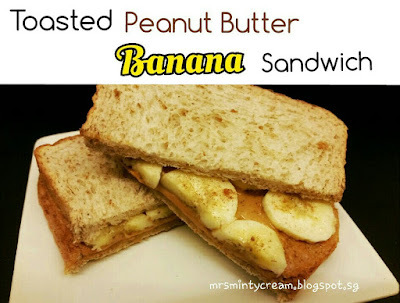 The nuttiness of the peanut butter goes so well with the sweetness of the bananas. No additional butter or spread needed at all. 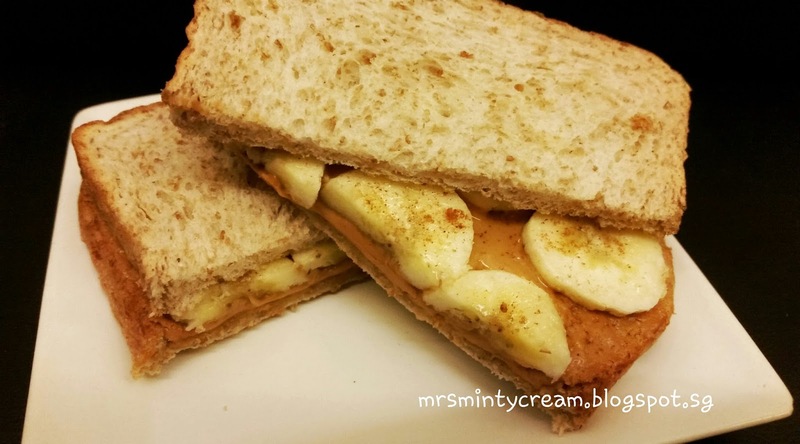 To add on to the flavour, I added a dash of cinnamon powder over the bananas and YUM! 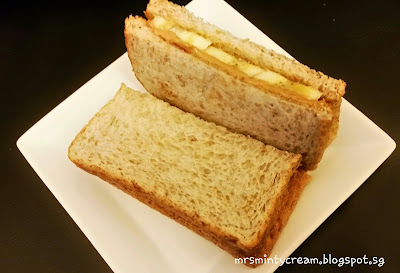 The fragrance of the cinnamon powder just elevated the sandwich to another level. This is so simple and fuss-free and you can easily fix this up in like 15 minutes? So why not give this a try tomorrow morning. There! You have something to look forward to for tomorrow already! 1. Spread peanut butter evenly onto one side of each slice of bread. 2. Using air fryer, toast the bread at 180C for 3 - 5 minutes until it is lightly browned. 3. Remove bread from air fryer and place banana slices onto the peanut buttered side of one slice of bread. 4. Dust lightly with cinnamon powder. Top with the other slice of bread and press together firmly.